On Friday 18th June the SOPAC Director Dr Russell Howorth handed over 8 desktops, 8 laptops, a photocopy machine, Printer and Server to the Permanent Secretary for Provincial Development, Multi Ethnic Affairs, National Disaster Management and Sugar Mr Manasa Vaniqi in support of disaster information management in Fiji. Present at the handover were the Commissioners for the four divisions: Central, Eastern, Northern and Western. Each division will be allocated a desktop and a laptop for use in their respective Divisional Emergency Operation Centres. A Memorandum of Agreement was also signed at the handover outlining the roles and responsibilities of SOPAC and the Ministry in support of the initiative "Strengthening Disaster Information Management Systems". Bula Vinaka and Welcome to Footprints – the official newsletter of the Pacific Disaster Risk Management Partnership Network. Since reintroducing the newsletter in the last quarter of 2007, we have ‘reinvented’ the publication in an effort to be more reader-friendly in 2010. The changes include a new layout. 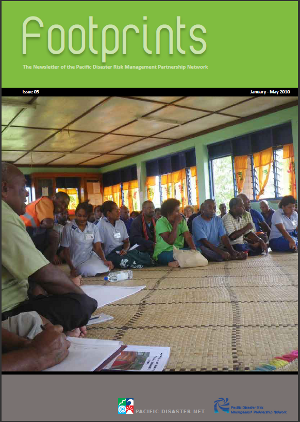 The title reflects the collective ‘steps’ taken by the partners, working with Pacific island country representatives, toward achieving the desired outcomes of the Pacific Disaster Risk Reduction and Disaster Management Framework for Action 2005-2015.In taking each step we leave behind ‘footprints’ as a record of where we have been, what we have done and what we have accomplished. I invite all partners to contribute regularly to Footprints. The recently established PREEN (Pacific Resource and Environmental Economics Network) unveiled its logo today at a prize giving ceremony hosted by the IUCN in Suva. The logo depicts land, sea, fish, turtles and mangroves. Also included in the logo is a scene of traditional fishers at work. Cyclones are among the most frequently occurring natural disasters in the tropical Pacific, and they are characterised by high waves and strong winds. At the time of tropical cyclone Tomas ocean surface waves up to eight meters high were reported to inundate villages on Vanua Levu. Such an extreme event can lead to coastal erosion or accretion, depending on the configuration of the particular shoreline. It is however difficult to imagine such large waves, and even more difficult to assess their impact without direct measurements in the location concerned. 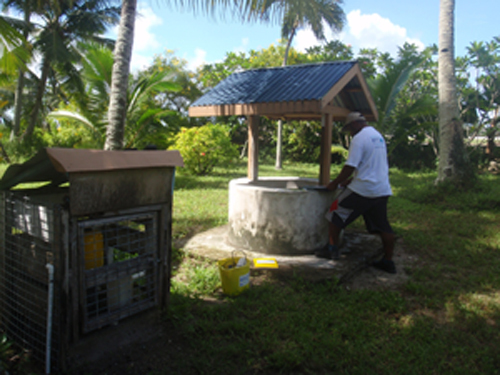 Between March and April 2010 SOPAC and the Government of Nauru conducted a survey of every well in Nauru to determine water quality, usage, and possible areas of contamination. Nauru has no significant surface water resources, limited groundwater resources, and is extremely vulnerable to drought. Water for domestic use comes from a mixture of desalinated water delivered by truck, rainwater harvested from roofs, non-potable coastal groundwater, seawater and limited use of the thin freshwater lens found under Nauru’s central plateau. Two locally based teams surveyed 336 wells by going house to house over 5 weeks. 30% of Nauru’s population rely on water from domestic wells for bathing, washing, general cleaning, and toilet flushing. Welcome to the May 2010 issue of Snapshots. This month we highlight some of the progress that we’ve made in relation to DRM mainstreaming particularly through our efforts in Papua New Guinea. the 10th meeting of the World Bank’s GFDRR Results Management Council; the training undertaken by the Pacific DRM Training Programme of The Asia Foundation/US Office of Foreign Disaster Assistance, and; the on-going development of a regional exposure database jointly being implemented by SOPAC, ADB, World Bank, AIR Worldwide, GNS Science New Zealand and the Pacific Disaster Center in Hawaii. Enjoy! Much has been said about rising sea levels and predicted impacts on low lying Pacific Island communities.As Pacific islanders we need to be more informed about what directly affects us and our livelihoods. The population of the Pacific islands is estimated to be over 8.6 million people, most of which are coastal dwelling and are therefore dependant on the ocean and its resources. So it is vital that we understand our ocean. The Pacific Islands Applied Geoscience Commission (SOPAC), hosts the South Pacific Sea Level and Climate Monitoring Project alongside other initiatives aimed at improving our scientific knowledge of ocean and island ecosystems for the sustainable management of natural resources. SOPAC Director, Dr Russell Howorth, was appointed to the Circum-Pacific Council for Energy and Mineral Resources at its recent meeting in Wellington, New Zealand. In accepting the appointment he expressed his pleasure at being able to strengthen a partnership between the Council and SOPAC that goes back some 30 years. The Council was founded 1972. It is a non-profit international organisation of earth scientists and engineers. 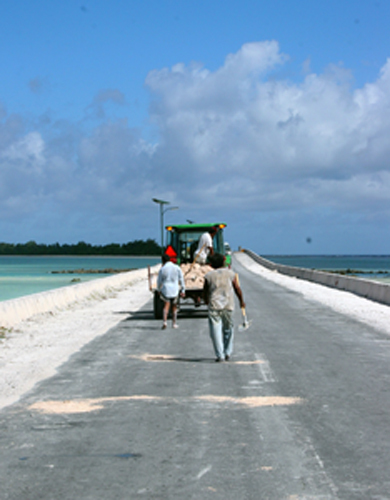 The Council develops and promotes research and cooperation among industry, government and academia for the sustainable utilisation of earth resources in the Pacific Region. The Secretariat of the Pacific Community (SPC) has embarked on a programme to build capacity in mapping land/forest cover in Fiji using very high resolution satellite images. The programme has three phases consisting of both theory and practical work, including ‘ground truthing’ (on-site verification of data from satellite imagery) exercises to be held later this month. The training, which is jointly organised by SPC’s Land Resources Division (LRD) and its Applied Geoscience and Technology (SOPAC) Division, involves participants from the Fiji Department of Forestry and SPC. The ground truthing exercise will be undertaken in Drawa – a model area for sustainable natural resource management located in Vanua Levu that covers about 6,400 hectares of indigenous forest.